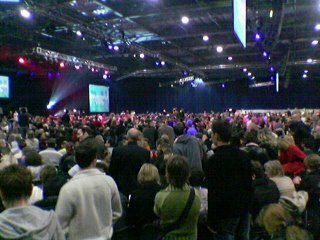 Back in February 2006 I attended the Tony Robbins ‘Unleash the Power Within‘ seminar at the Excel Centre in London and was blown away by the event. For good while afterwards I was definitely running at a higher tempo, getting more done, eating better, spending less and being more productive in my work and personal goals. Since then I’ve slipped back a little but the information is still there. I KNOW what I have to do…. If you’ve never heard of American self-help guru Tony Robbins you have somehow managed to avoid coming into contact with one of the most extraordinary people on Earth. It’s a grand statement whatever your definition of extraordinary is as the term means wildly different things to different people. It is perhaps not surprising therefore that the opinions of people who have encountered him contrast so greatly. To many he is the second coming, a person with the power to create miracles in the lives of everybody but then there are those who think he is a cheat and a charlatan who is making vast sums of money out of exploiting peoples dreams. What is it about this man which so polarises public opinion? Does he really want to change the world or is just after a quick buck? Now, I’ve always been interested in self-improvement but had never got very far with it and life trundled along without really changing too much. Through reading books and listening to tapes I learnt a certain amount but I lacked the conviction to follow the actions through. Personally speaking I had heard of Tony Robbins but I’d decided to steer clear of his work because the brash American overtones and evangelical approach turned me off – it was too much ‘in your face’. Then last Autumn, after a bad day at work and a particularly depressing visit to the bank, I chanced across a 2CD set called ‘Unleash the Giant Within’ in a local book shop. Typical of my lazy state at the time and of not wanting to read the two inch thick book equivalent I decided to buy this audio package. I wanted to know if he really was someone that could talk to me in a way that would motivate me where others had failed. Interestingly, I bought the package on the company credit card as I had no money in my own account. That was wrong because I did not have the authority to do so but in hindsight I was actually following Tony’s advice before I’d even heard it – I was taking action. I was doing something to make a difference now rather than sit and do nothing and hope things got better. In case you’re wondering the money was deducted from my salary the following month. So what did ‘Unleash the Giant Within’ teach me? Well, this audio edition was an extremely truncated affair which had more of an impact in whetting my appetite for further information rather than changing my life. Tony had a voice that sounded so rough I felt that he must use gravel as mouthwash. There was no doubting this guys enthusiasm and his progress had been incredible so I had to dig a little deeper to find out more. I began to trawl the web for information and I chanced upon a website that was offering a free copy of his book, ‘Notes from a friend’. When people like Soviet president Mikael Gorbachev and tennis legend Andre Agassi start calling for advice then you realise that this guy must be someone special. As I read the book I did get the sense that anything is possible as long as I made the decision to go for what I wanted. I felt inspired and began using the techniques described and made some good progress but once I’d come to the end of the book I didn’t continue what I had been learning and slipped back into the same, tired routine of being frustrated with life and the world. Then, a few strange things started happening. It seemed that through some startingly poor money mismanagement I’d been paying over the odds for household bills and subsequently found ways to reduce monthly outgoings quite considerably. My wife’s personal injury claim finally came through and then an unexpectedly high work bonus appeared. I took all this as a sign. 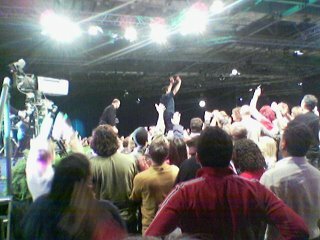 If I was ever going to attend a Tony Robbins seminar it had to be now or I’d never do it. For the first time in years I had some disposable income that could invest in something – me – that could turn my life around. 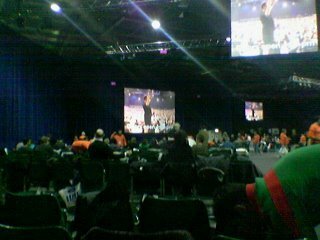 I rang up Tree Event Management who were staging the event on behalf of Tony Robbins Europe and enrolled. There was no going back. 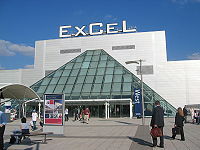 So it was with a sense of some trepidation but no less excitement that I attended the 4-day Tony Robbins seminar at the Excel Centre in London. To many these events are a rip-off by a brash, over-the-top Yank and it is easy to see why many are sceptical because there is a definite twang of the American evangelist about the whole Tony Robbins circus. Could he really impact my life when there was 10,000 other people in the room? The first day began at around 2.00pm and was designed to whip the crowd up into a frenzy at the earliest possible opportunity. There was loud music to get people going and a backup ‘crew’ who whooped and handed out high-fives and toothy grins to anyone and everyone. For the first time I wondered whether this was for me because its intensity was so strong. To get the full benefit I had to step out of my comfort zone which I guess was the whole point. Tony came to the stage to a raptuous welcome as you’d expect. The itinerary was designed to enable the audience to discover within themselves that we had the power to change everything in our lives and to prove the point, we would end the night by storming barefoot across a bed of glowing hot coals! Whoo-ah there! This is only the first night! Surely that’s something that would be saved for the end and apparently that was how it was originally envisaged. It has since been brought to day one so that everyone knows what they are capable of from the start rather than worry about it and have doubts over the weekend. If this was only the start, what else was there to come. Clearly this was way too much for some and having sat for the first hour in their coats and not immersing themselves into the event they walked out. This is fairly common apparently but is staggering that some people would give up on something so soon especially as some tickets cost over £1500. I spent much of this first day sat next to a Danish couple and when necessary I completed the exercises with the girl named Julia while her fella mixed elsewhere. He’d been before and knew that to get the full benefit you had to do these tasks with strangers. After four or five hours of getting to know someone in such a way where we were exploring our minds as well as that of our partner we felt very tuned in to each others feelings. This is why we had no doubt that we would walk across the hot coals. It was a must. First of all we had to leave the building and follow 10,000 people into the car park and wait for them to do the same before our turn would come. It was very cold and we had walk there in barefeet which I thought may not be a bad thing as it would take my feet longer to warm up once on the coals! As the moment of truth approached Julia and I got ourselves into the correct mental state before striding the 12 feet across the coals and then celebrating like crazy on the other side where we hugged each other as if our lives depended on it. Think about this. How many times have you stopped yourself from doing something because you’ve been unsure of the outcome? You may have lacked the confidence which meant you didn’t even try. Don’t worry about it because I was the same and yet it took me just five seconds preparation time at the start of the coals to get myself ready before walking the 12 feet to the other side. This was powerful stuff and had my head was spinning. Julia and I had only just met but we’d shared something that would remain with us for the rest of our lives. We felt privileged to witness the others success. As we returned to the main building my feet felt kinda felt spongy as if I was wearing slippers. For the first time I wondered whether I had actually done myself some damage. My feet felt warm as I’d walked across but it wasn’t in anyway uncomfortable. I just had to wait for the morning to see how they shaped up. Well, when I woke up my feet weren’t sticking to sheets, they weren’t covered in blisters but they were pretty dark in colour thanks the accumulated dirt of a London Exhibition Centre car park. The most memorable part of the second day which lasted from 9.00am until 11.00pm was when we were asked to lie on the floor and relax. I could do that. Then, the lights were lowered and a wide variety of music was played designed to make everyone think deeper about what we all wanted from our lives, what was important to us and what real success in our lives would represent. While ‘My heart will go on’ by Celine Dion played – a cringe worthy tune at the best of times – I thought of my children and my wife and I wept buckets. It was an experience more intense than I’d ever felt before and the rest of the room was the same. It’s a cliché but the atmosphere in the room was electric. To change the mood Tony got us laughing for what appeared to be no reason whatsoever. It started a chain reaction where none of us could stop – it was just incredible. The day was made even more amazing thanks to one special lady I met afterwards called Pip. With her I shared the most powerful breakthrough moment that left us both in floods of tears as she overcame an issue concerning the death of her mother that had been holding her back for FORTY YEARS! It was moment in my life I shall never forget. Friday had been amazing, Saturday was better still and Sunday just blew me away even though during the afternoon my mind was shooting off in so many different directions I didn’t perhaps focus on my REAL deep issues as much as I would’ve liked. I still managed to delve into areas of my sub-conscious I didn’t even know about as all my self-limiting beliefs came to the surface. It was becoming too much to take in but it was still a cleansing experience. Towards the end of the evening came a salesy part for Tony Robbin’s Mastery University which I found on a personal level a bit destructive. It went on too long and you could really feel the mood in the room drop especially once the price had been given. Success suddenly felt a long way off again and I guess that in that moment I realised I hadn’t shifted as much as I’d thought. The focus for the final day was on health because without the energy and vitality it becomes that much harder to follow through on all the other aspects covered beforehand. It seems that our diets are crammed with stuff that are harmful and was perhaps even more shocking is that most of us aren’t even breathing properly. The more oxygen we get in our lungs the better but we tend to only use half their true capacity. Overall Monday was a bit of a damp squib in comparison to the previous three days but there was still some good stuff in there. Tony didn’t appear in person but only on a big screen in a video from the nineties with his chief trainer giving a presentation on stage. His video looked and felt dated and because the material didn’t follow the order listed in the delegate packs, some people lost interest and therefore, much of the impact. It was a disappointing end for me because I had leave a couple of hours before the finish to catch a train but I did at least meet up with Pip again and she was a changed woman. That lifted me a great deal. There were some who felt let down by Tony’s non-appearance on Monday but when you considered he had presented for 36 hours over 3 days with hardly any breaks with that kind of intensity there are very few people anywhere that could have performed so well, for so long. It’s now been more than a year since I went to the event and I’m pleased to say that much of what I learnt during those four days still form the basis for my everyday living but I’d be liar to say that my life has changed completely. What I can say is that I feel more confident in myself and my abilities, I’m calmer in stressful situations, I use self-talk that inspires rather than brings me down. You may also be interested to know that I had to have an inhaler for an asthma problem at the beginning of the year and I’ve not needed it since that weekend. The breathing technique we were taught really does work. I’ve also cut out coffee which I was drinking up to five cups every single day. Unleash the Power Within has changed my life in ways I wouldn’t have believed before hand and I am now looking forward rather than back. Like I say, it’s not perfect but life is certainly getting better.